Use these expert-backed tips to help your long-distance relationship thrive. I clearly remember the moment in college when my boyfriend asked me to be his girlfriend. As in most young relationships, our future together seemed full of hope and exciting possibilities. Neither of us could have imagined the way our future together would actually unfold. Four months later, Adrien (the boyfriend) dropped a relationship bomb on me: He would be moving back to his birth country, France, for the next three or four years to finish school abroad. We were suddenly faced with impossibly difficult questions, like Can our relationship survive years of long distance?, and Do we even want to try? In relationship terms, four months is far too short a time to be making important, not to mention long-term, life decisions together. Deciding to stick it out would mean seeing each other only in choppy one- to four-week intervals a few times a year, for the next three-plus years. After all, we would be separated by 3,000 miles and a six-hour time difference. Breaking up was the glaringly obvious option, and probably the one that most new couples would choose. However, we both felt that we had something too special to give up. We’re still happily together today, three years later. But the journey has changed us both enormously. Committing to staying together despite the long distance has taught us the true meaning of working hard for a relationship. Two and a half years into this intercontinental marathon, we’re still far from perfect, but we’ve grown together gracefully. We learn more about how to be supportive of each other’s needs from afar each and every day. While standard advice like “communicate with your partner” and “make time for each other and yourselves” is important, it doesn’t always account for the less obvious issues that arise — like coordinating busy schedules, or resolving hurt feelings from thousands of miles apart. Here is some experience- and expert-backed advice will help you cope with painful, unexpected stressors, and make it through a long-distance relationship stronger than ever. 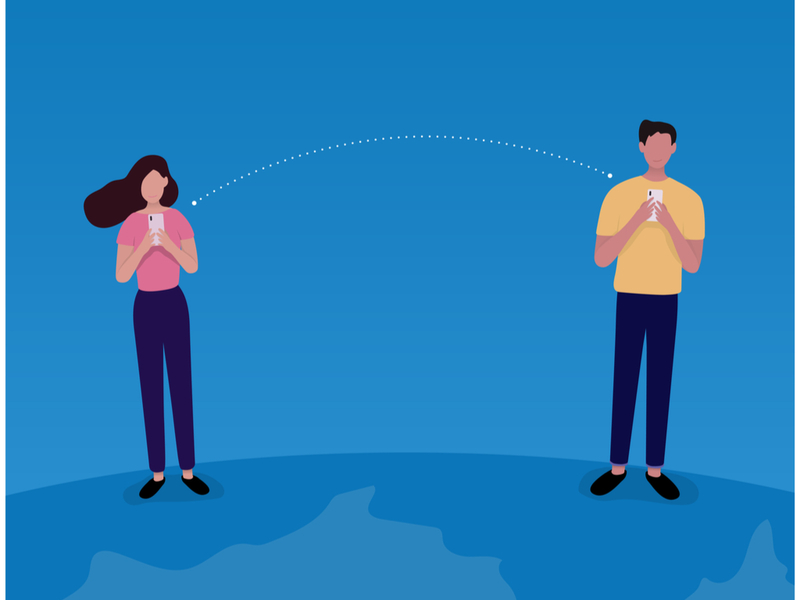 In a long-distance relationship, there are plenty of factors that can get in the way of communicating with your partner: jam-packed schedules, different time zones, and balancing your time with friends and family, to name a few. How do you make time for each other when both of you are stretched too thin? Talk about your schedules at the beginning of the week, and commit to a time each day (or as often as you’d like) to talk. Planning for a specific time — and sticking to it as you would any scheduled meeting — not only ensures that you will get to talk, it also helps avoid any resentment that might crop up from missing a conversation because one of you didn’t plan your time effectively. Focus on the quality of your conversation, rather than the quantity. Studies show that long-distance couples actually report higher levels of satisfaction with their communication than couples in close proximity. When couples have less time, they tend to use it wisely. Long-distance relationships can be mentally and emotionally draining. It can be tough to strike a healthy balance between spending time with your partner, friends, and family — let alone yourself. And when this happens, it’s easy to become angry, or resent the distance between you and your significant other. Long-distance partners have a tendency to put their lives on hold or neglect other relationships, and are left feeling isolated and resentful as a result, Andrea Bonior, Ph.D., clinical psychologist and best-selling author of Psychology and The Friendship Fix, writes in Psychology Today. This is especially true when the separation was supposed to be short-term but unexpectedly got extended. Avoid this by making sure you’re cultivating a fulfilling life outside of the relationship. She advises that each partner focus on making their own life fulfilling, and making time for themselves and other loved ones. You can practice this through clear communication (i.e. “I’d like to have brunch with my friend, so can we talk in the evening instead?”), setting plans with other people in your life, and making time to engage in solo activities that bring you joy. One of the biggest surprises for me in starting a long-distance relationship was how difficult simple things, like communicating and resolving arguments, became. I imagined that if I followed textbook long-distance relationship survival advice it would be pretty smooth sailing. In reality, distance amplifies regular relationship issues — a lot. It also makes them harder to resolve. After an argument, you can’t make up with a big hug, and if there’s a substantial time difference between you, someone often goes to bed angry. As much as you care for your partner, the reality is that both of you are independent people. As in any relationship, it’s inevitable that you will make mistakes and probably hurt each other along the way. While this is hard to cope with at the time, it can actually bring you closer together in the long run. Communicate openly and honestly with each other about your feelings and needs — and don’t do it via text. It’s important to talk through problems and arguments while they’re still fresh, as distance can exacerbate the issue and cause feelings of resentment to fester, Paulette Sherman, Ph.D., a psychologist specializing in relationships tells Marie Claire. She also recommends talking on the phone rather than texting during a fight, as it’s easier to explain oneself and avoid miscommunication. Understand that even when you try your best, sometimes you’ll miss the mark — and that’s OK. In my relationship with Adrien, I’ve found that our most valuable lessons have come out of the times that we’ve failed each other. This sounds paradoxical, but it makes sense — because after we mess up, we’re able to talk deeply and honestly about how we can fix the problem and prevent it from happening again. Rather than using mistakes as ammunition, use them as opportunities to strengthen your communication, and learn and grow together.